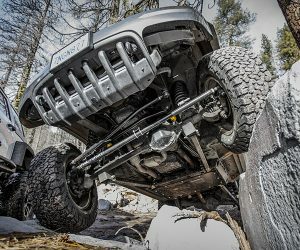 Our fully adjustable ultra strong track bar for the WJ Grand Cherokee! 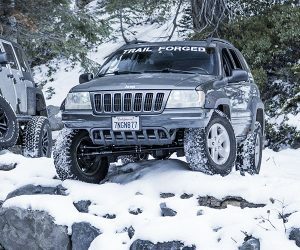 Fully adjustable, ultra strong track bar for your 99-04 Grand Cherokee WJ. Massive 1.5″ Carbon Steel track bar built using a genuine Currie Johnny Joint combined with a Synergy Mfg Dual Durometer flex rubber bushing at the opposite end. 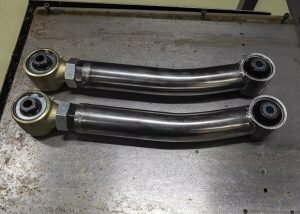 The best bolt in track bar solution for WJ Jeeps. 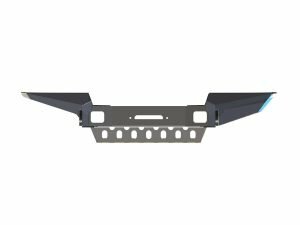 Works with lift heights from 2″ to 6.5″. 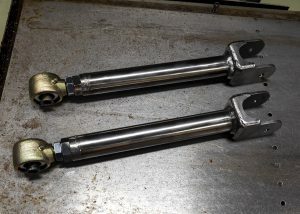 Current track bar hitting your differential or binding on your axle bracket? 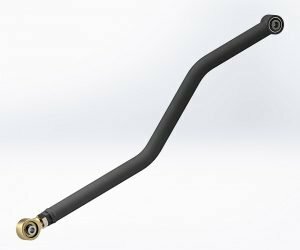 Our track bar is designed to maximize travel both down and up, giving you the most flex without binding or unwanted contact. 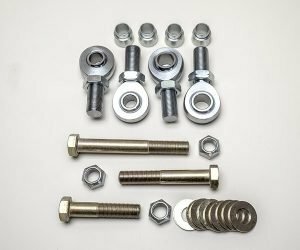 Massive 9/16″ Grade 8 bolts are included, fixing your stock size small wallowed out holes and giving you a massive strength boost all at once (drilling required). 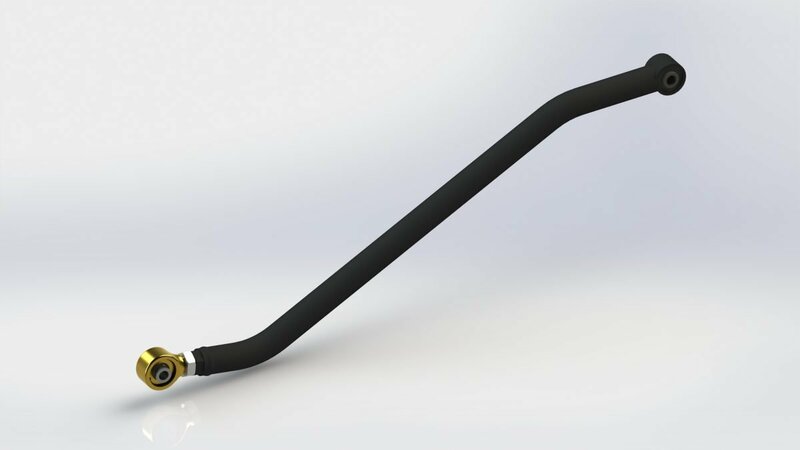 1.5″ OD 0.25″ wall high tensile Carbon Steel tube makes this track bar incredibly strong. And lighter than 1.25″ solid steel to boot. 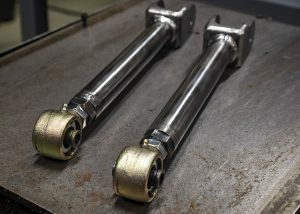 Genuine Currie Johnny Joint at the axle (where it should be for multi-plane flex) for legendary strength, longevity, and up to 40 degrees misalignment. No poly bushings! Polyurethane is absolutely the wrong material for track bar bushings. 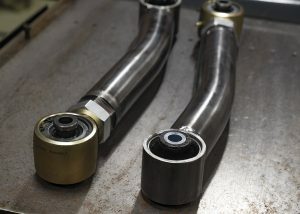 If there are poly bushings anywhere on your current track bar setup, you are sacrificing ride quality and longevity. 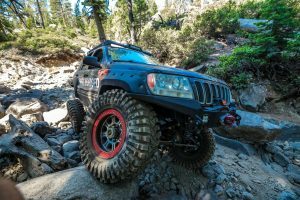 2″ minimum lift height, and minimum of 2″ Bump stop extensions recommended. 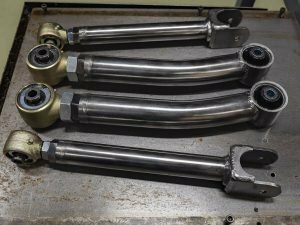 While we make an effort to stock bare and powder coated track bars, and typically ship within a few days, if we do not have inventory there may be lead time. (Bare typically within 1 week, powder up to 2-3 weeks). Please contact us if you have a time sensitive need to confirm our current inventory. 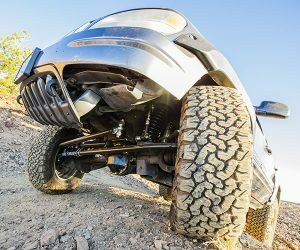 Vehicles with large amounts of front axle stretch, or radius arm setups with low pinions and excessive droop may experience some contact between the track bar and axle bracket. 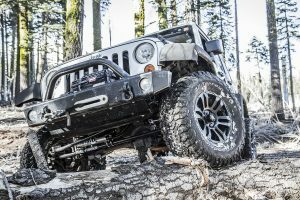 Responsible clearancing of the bracket can be done, but for long armed and/or high lift (4″+) WJ’s we do recommend moving to an OTA/OTK setup with our Ultimate Kit.